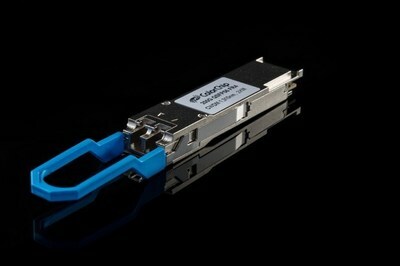 YOKNEAM, Israel, Jan. 31, 2019 /PRNewswire/ -- ColorChip, a global leader in photonic integrated transceivers, contributed it's 200G QSFP56 FR4 2km transceiver to the Ethernet Alliance sponsored Higher Speed Networking Interoperability Plugfest event, held in the University of New Hampshire's Interoperability Lab (UNH-IOL) in Durham NH. The plugfest advances new Ethernet technologies that are required to meet the rapidly expanding bandwidth demands of a connected world, working towards the next generation of networking solutions that are robust, energy-efficient and cost effective. "The Higher Speed Networking plugfest aimed to improve the interoperability of the Ethernet ecosystem at port data rates from 25Gb/s through 400Gb/s," commented Dave Chalupsky, plugfest Chair and Board member, Ethernet Alliance, and network product architect, Intel Corporation. "The testing matrix included PHY's, NIC's, switches, test equipment, as well as optical and copper media types, provided by members of the Ethernet Alliance and 100G Lambda Multisource Agreement Group." One of ColorChip's contributions to the plugfest was the 200G QSFP56 FR4 2km optical transceiver, which leverages ColorChip's field-proven mlti-generational optical engine platform, based on proprietary SystemOnGlass™ technology. Claus Hoyer, VP of Engineering at Xena Networks commented, "We have tested the ColorChip 200G FR4 module with Xena's Valkyrie 400GB traffic generation and analysis test platform, Thor-400G-7S-1P, and found the module to display excellent performance with plenty of margin." ColorChip (www.color-chip.com), established in 2001, is a technology innovator in the field of photonic integrated hybrids whose vision is to break open the optical interconnect bandwidth barrier with high-speed optical transceiver solutions to support the explosive bandwidth demand of datacenters. Headquartered in Yokneam, Israel, ColorChip leverages its fully owned, industrialized optics-based FAB dedicated to the production of PLC based SystemOnGlass™ optical engines, whose glass platform is the ideal medium for emerging PAM4 applications. ColorChip has production facilities in Israel and Thailand, and offices in San Jose, California.